At ArtFactory.com we believe in building custom, fine art quality furniture inspired by history. When building historically correct design, it is especially relevant to build using original craft and materials. In other words, not reproduction quality, but a top quality product that is built to be as good or better than its original historic inspiration. Every historically inspired design that we make is build under the supervision of, inspected by, and certified with the seal of world renowned artist H.J. Nick. The H.J. Nick signature assures that your custom furnishings meet all world class fine art standards, are built to historically correct specifications, and have future heirloom value in antiquity. That is why we crafted this Phelan & Collender inspired pool table from solid maple, just as they would have during the Victorian Era. Furthermore, like all of our solid wood products, it is bonded with mortise and tenon joinery. This means no screws, glues, or any other fast process, only world class quality craftsmanship, and products that are built with tried and tested old world methods. Finally, all of our wood furnishings are finished using a hand applied, multi step process that blends the stain into the grain of the wood. This painstaking process assures of a finish that will look good for years to come instead of fading, flaking, or scratching like painted on finishes. The earliest known billiard table, in the royal court of Louis XI of France (1461 1483), was simply lawn brought indoors and placed on a large, everyday table. Rail-bounded, cloth-covered tables specifically for billiards, with wooden beds rail cushions (made of layered felt, or stuffed with straw, soon evolved as the game's popularity spread among French and later other European aristocrats. This was not initially a success, as the elasticity would vary with ambient temperature. After attempting to market cushion warmers with only partial success, Thurston was saved by the 1843 discovery of vulcanization by English engineer Thomas Hancock. Thurston used vulcanized rubber in his later cushions, and it is still used today by many manufacturers (some use synthetic materials). Thurston's first set was presented to Queen Victoria. Construction: The heavy framework of the body is built up in what is technically known as mortise and tenon construction - various kinds of hardwoods tongued and grooved together and double cross in set on the outside and inside, the outer woods being handsomely grained. The legs are built up in the same way. No major frame parts bolt on all of our tables. Most table construction is better than the original. Cushion Rails: 1 3/4" thick x 3 3/8" with facing complete 2 1/4" x 4 1/8". Compound construction built up of various kinds of hard woods of different grains. Plain solid corner blocks covering joint bolt heads. Cap rails 7/8" x 3 7/8" on upper surface and covered with Walnut Cherry or Rosewood 1 4/" thick. Solid hardwood corners. Ivory or mother of pearl diamond sights. Inlaid cushion bolts covered by what is known as blind cushion rails. Also inlaid name plate. Eight rail bolts one each side and 4 on each end of 4 1/2 x 9' table and 10 rail bolts on each side and 5 on each end of x 10' table. Slate Bed: Best quality Italian slate , 3 pieces to the set. The joints are made with brass dowels and sockets with no screw holes in playing surface. Thickness of slate either 1" - 1 1/2" or 2"
Cushions: The cushions furnished with this table, unless otherwise specified, are our celebrated Match Game perfect angle custom. Pockets: The pocket irons are the No. 6 style which are countersunk in the ends of the cushion rails by means of a brass socket. Black cover leathers reinforced at point of contact giving extra durability. Best quality red trimming leather and green fringe. No. 10 best quality green worsted or hand made leather pockets, as may be preferred. Order Over Size Or Regulation size, with a playing field of 44"W X 88"L and features a full 1"- 2" thick, three piece, oversized Italian slate bed. The 5 3/4" wide rails are created from cherry wood and have hand beveled edges and beautiful inlaid mother of pearl diamond sights. The highest quality K-66 profile cushions and tournament spruce felt (other colors available), have been used in creating this piece. Decorative beveled skirt edging complements all four sides. Special mar proof leveling feet have been used to insure accurate leveling. All the wood surfaces are finished with 10 process of hand rubbed finish. This item is shipped to your location ready to be set up and leveled by a qualified professional. All our tables exceed the equipment standards specified by the Billiard Congress of America. It is regulation size, with a playing field of 44"W X 88"L and features a full 1" thick, three-piece oversized Italian slate bed. The 5 3/4" wide rails are created from cherry wood and have hand bevelled edges and beautiful mother of pearl inlaid sights. The highest quality K-66 profile cushions and tournament wine felt (many colors available) have been used in creating this piece. The pockets and baskets are designed to B.C.A. specifications and are created from the highest quality, fine grained leather with braided tassels. The base is designed from solid matching hardwoods. Cushions (also sometimes called "rails", "rail cushions", "cushion rubber", or "bumpers") are located on the sides of the tables rails. There are several different materials and design philosophies associated with cushion rubber. The cushions are made from an elastic material such as vulcanized (gum or synthetic) rubber. The chiefly American jargon "rail" more properly applies to the wooded outer segments of the table to which the cushions are affixed. The purpose of the cushion rubber is to cause the billiard balls to rebound off the rubber while minimizing the loss of kinetic energy.The profile of the rail cushion, which is the cushion's angle in relation to the bed of the table, varies between table types. The standard on American pool tables is the K-66 profile, which as defined by the BCA has a base of 1-3/16 inches and a nose height of 1 inch . This causes the balls' rebound to be somewhat predictable during game play. Finally, snooker tables use the K-66 profile, like pool tables, but the cushion is an "L" shape. This is mostly[clarify] because snooker uses balls of a smaller diameter and smaller pocket entrances than does pool. Cloth Billiard cloth (sometimes erroneously called felt) is a specific type of cloth that covers the top of the table's "playing area". Both the rails and slate beds are covered with 21-24 ounce billiard cloth (although some less expensive 19oz cloths are available) which is most often green in color (representing the grass of the original lawn games that billiards evolved from), and consists of either a woven wool or wool/nylon blend called baize. Most bar tables, which get lots of play, use the slower, thicker blended cloth because it can better withstand heavy usage. This type of cloth is called a woolen cloth. By contrast, high quality pool cloth is usually made of a napless weave such as worsted wool, which gives a much faster roll to the balls. This "speed" of the cloth affects the amounts of swerve and deflection of the balls, among other aspects of game finesse. Snooker cloth traditionally has a directional nap, upon which the balls behave differently when rolling against vs. toward the direction of the nap. Carom billiards tables Or Pocketless carom billiards tables are used for such games as three-cushion billiards, straight rail, balkline, artistic billiards and cushion caroms. Regulation carom billiards tables are rectangles, with the bed of the table (the playing surface) measuring 10 feet by 5 feet (though 9 ft by 4.5 ft are increasingly common). The slate bed of carom billiard tables are often heated to about 5 degrees C (9 deg F) above room temperature, which helps to keep moisture out of the cloth to aid the balls rolling and rebounding in a consistent manner, and generally makes a table play faster. A heated table is required under international carom rules and is an especially important requirement for the games of three-cushion billiards and artistic billiards. Heating table beds is an old practice. Queen Victoria of England (1819-1901) had a billard table that was heated using zinc tubes, although the aim at that time was chiefly to keep the then-used ivory balls from warping. The first use of electric heating was for an 18.2 balkline tournament held in December 1927 between Welker Cochran and Jacob Schaefer, Jr. The New York Times announced it with fanfare: "For the first time in the history of world's championship balkline billiards a heated table will be used. 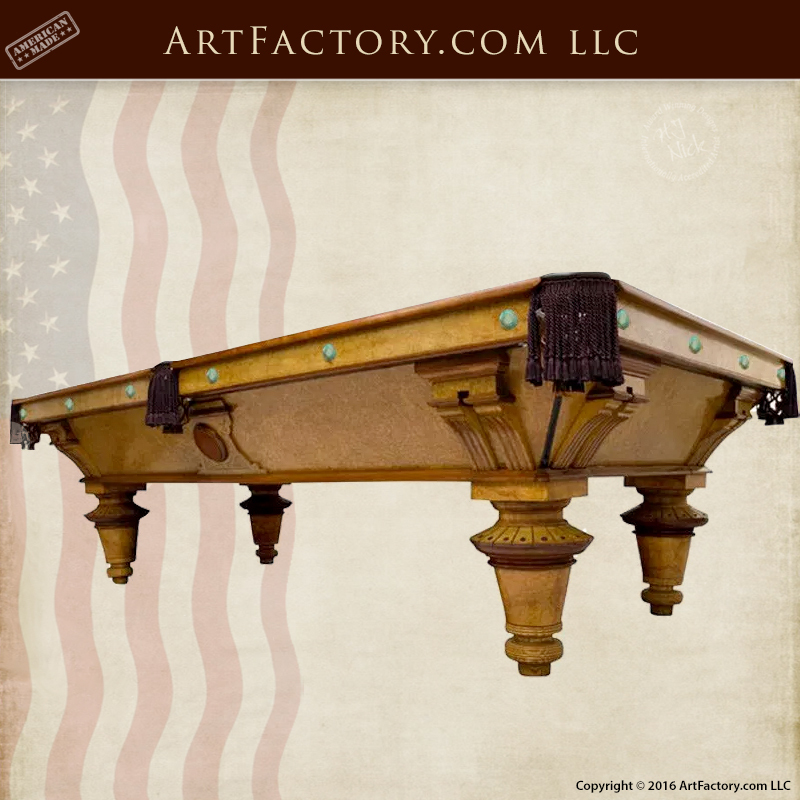 ArtFactory.com, an American manufacturer of custom pool tables, game room furniture, wood doors, gates, and designer furnishings based in Scottsdale, Arizona, and Designs by H.J. Nick, have been designing and building some of the world's finest furnishings all hand crafted in America since 1913. Most of our clients want a furnishing that has a big WOW factor and timeless elegance. They all want investment value furnishings that make a proper statement reflecting their personality, or the personality of the environment for which the designer custom furnishings are intended. Our master level craftsmanship ensures your custom game tables and furnishings will stand the test of time, and are Guaranteed Forever, backed by over a century of fine craftsmanship.